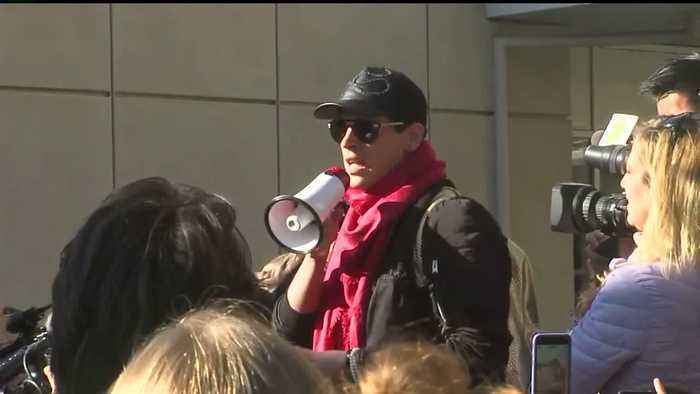 A federal judge has denied the school's request to dismiss the case against them, which stems from protests on UC Berkeley's campus that turned violent. TURNED THEIR HEADS AND LOOKTURNED THEIR HEADS AND LOOKTHE OTHER WAY SORT OFTHE OTHER WAY SORT OFTHE OTHER WAY SORT OFINTENTIONALLY ALLOWING FORINTENTIONALLY ALLOWING FORTHEM TO GET HURT THE CLASH OFIDEAS TURNING INTO A VIOLENTCLASH OF FORCE A SEED ALL TOOCLASH OF FORCE A SEED ALL TOOFAMILIAR ON SOME CALIFORNIAFAMILIAR ON SOME CALIFORNIAFAMILIAR ON SOME CALIFORNIAUNIVERSITY CAMPUSES THISFAMILIAR ON SOME CALIFORNIAUNIVERSITY CAMPUSES THISPARTICULAR PROTESTS TURNEDUNIVERSITY CAMPUSES THISPARTICULAR PROTESTS TURNEDPARTICULAR PROTESTS TURNEDRIOT. NOW AT THE CENTER OF ALAWSUIT CURRENTLY CASE MUCHVIOLENCE IN REAL INNOCENTVIOLENCE IN REAL INNOCENTVICTIMS TUESDAY. A FEDERALJUDGE RULED THAT THERE ISJUDGE RULED THAT THERE ISJUDGE RULED THAT THERE ISENOUGH EVIDENCE TO MOVEENOUGH EVIDENCE TO MOVEENOUGH EVIDENCE TO MOVEFORWARD WITH A LAWSUITFORWARD WITH A LAWSUITFORWARD WITH A LAWSUITAGAINST THE UNIVERSITY OFAGAINST THE UNIVERSITY OFAGAINST THE UNIVERSITY OFCALIFORNIA ATTORNEY SEANCALIFORNIA ATTORNEY SEANCALIFORNIA ATTORNEY SEANSTEEL REPRESENTS FOR PEOPLESTEEL REPRESENTS FOR PEOPLESTEEL REPRESENTS FOR PEOPLEWHO CLAIM THAT THEY WERESTEEL REPRESENTS FOR PEOPLEWHO CLAIM THAT THEY WEREASSAULTED ON BERKLEY'SWHO CLAIM THAT THEY WEREASSAULTED ON BERKLEY'SASSAULTED ON BERKLEY'SCAMPUS. THE NIGHTCONSERVATIVE PROVOKED TOURCONSERVATIVE PROVOKED TOURMILO YOU ANNAPOLIS WAS SENTMILO YOU ANNAPOLIS WAS SENTTO SPEAK TO THEIR LAWSUITTO SPEAK TO THEIR LAWSUITTO SPEAK TO THEIR LAWSUITALLEGES THAT UNIVERSITYALLEGES THAT UNIVERSITYADMINISTRATORS TOLD POLICE TOADMINISTRATORS TOLD POLICE TORETREAT ALLOWING ANGRYRETREAT ALLOWING ANGRYRETREAT ALLOWING ANGRYPROTESTERS TO ATTACKRETREAT ALLOWING ANGRYPROTESTERS TO ATTACKCONSERVATIVES WHO CAME TOPROTESTERS TO ATTACKCONSERVATIVES WHO CAME TOCONSERVATIVES WHO CAME TOHEAR THE ANNAPOLIS. PROTECTORWERE TOLD TO GO DOWN THISWERE TOLD TO GO DOWN THISPATH TURN OUT TO BE A VERYPATH TURN OUT TO BE A VERYVIOLENT TOP A YOUNGVIOLENT TOP A YOUNGVIOLENT TOP A YOUNGCONSERVATIVE ON ON MOSTCONSERVATIVE ON ON MOSTCONSERVATIVE ON ON MOSTAMERICAN CAMPUSES ARE REALLYAMERICAN CAMPUSES ARE REALLYAMERICAN CAMPUSES ARE REALLYIN TROUBLE STEEL SAYS THIS UCIN TROUBLE STEEL SAYS THIS UCIN TROUBLE STEEL SAYS THIS UCBERKELEY EPISODE IS JUST ABERKELEY EPISODE IS JUST ASYMPTOM OF A LARGER PROBLEMSYMPTOM OF A LARGER PROBLEMCONSERVATIVE IDEAS ARE NOTCONSERVATIVE IDEAS ARE NOTWELCOME ON COLLEGE CAMPUSESWELCOME ON COLLEGE CAMPUSESAND THOSE OPPOSED TO THEM AREAND THOSE OPPOSED TO THEM AREAND THOSE OPPOSED TO THEM AREWILLING TO GET VIOLENT TOWILLING TO GET VIOLENT TOWILLING TO GET VIOLENT TOSILENCE THEM A LOT OFSILENCE THEM A LOT OFSILENCE THEM A LOT OFSTUDENTS ON CAMPUS ARE NOTSTUDENTS ON CAMPUS ARE NOTSTUDENTS ON CAMPUS ARE NOTCOMFORTABLE SHARING THEIRSTUDENTS ON CAMPUS ARE NOTCOMFORTABLE SHARING THEIRBELIEFS IF THEIR CONSERVATIVECOMFORTABLE SHARING THEIRBELIEFS IF THEIR CONSERVATIVEBELIEFS IF THEIR CONSERVATIVEBELIEFS IF THEIR CONSERVATIVEOUT OF FEAR OF RETRIBUTIONOUT OF FEAR OF RETRIBUTIONOUT OF FEAR OF RETRIBUTIONOUT OF FEAR OF VIOLENCE.OUT OF FEAR OF VIOLENCE.OUT OF FEAR OF VIOLENCE.WE'VE RECEIVED DEATH THREATSWE'VE RECEIVED DEATH THREATSWE'VE RECEIVED DEATH THREATSSIMPLY FOR SPEAKING OUT. RYANGARDNER CHAIRS THE DAVISSIMPLY FOR SPEAKING OUT. RYANGARDNER CHAIRS THE DAVISCOLLEGE REPUBLICANS AT UCGARDNER CHAIRS THE DAVISCOLLEGE REPUBLICANS AT UCCOLLEGE REPUBLICANS AT UCDAVIS. THERE EVENTS FEATURINGCONSERVATIVE SPEAKERSCONSERVATIVE SPEAKERSINCLUDING ANNAPOLIS HAVE ALSOINCLUDING ANNAPOLIS HAVE ALSOBEEN CANCELED AND DISRUPTEDBEEN CANCELED AND DISRUPTEDBEEN CANCELED AND DISRUPTEDBECAUSE OF VIOLENT PROTEST.BECAUSE OF VIOLENT PROTEST.WE ALWAYS SAY THAT YOU KNOWWE ALWAYS SAY THAT YOU KNOWFREE SPEECH IS IMPORTANTFREE SPEECH IS IMPORTANTFREE SPEECH IS IMPORTANTBECAUSE WE WITHOUTBECAUSE WE WITHOUTBECAUSE WE WITHOUTCONSERVATIVE SPEAKERS ARECONSERVATIVE SPEAKERS ARECONSERVATIVE SPEAKERS AREOUTSIDE PERSPECTIVES STUDENTSOUTSIDE PERSPECTIVES STUDENTSWILL NEVER BE INTRODUCED TOWILL NEVER BE INTRODUCED TOIDEAS THAT THEY'RE NOTIDEAS THAT THEY'RE NOTIDEAS THAT THEY'RE NOTFAMILIAR WITH GARDNER SAYS ITFAMILIAR WITH GARDNER SAYS ITFAMILIAR WITH GARDNER SAYS ITSHOULD BE ANY UNIVERSITIESSHOULD BE ANY UNIVERSITIESSHOULD BE ANY UNIVERSITIESPRIORITY TO KEEP IT STUDENTSPRIORITY TO KEEP IT STUDENTSPRIORITY TO KEEP IT STUDENTSSAFE. Lori Loughlin Surrenders to Federal Authorities in College Admissions Scandal The 'Full House' Star is scheduled to appear before a federal judge in LA on Wednesday afternoon. She is one of dozens..